For even doneness and browning, line up the stalks along the grill rack and roll often. Snap off and discard woody bases from asparagus. On a platter, drizzle asparagus with butter and sprinkle with dill, garlic, and pepper. Toss to combine. For a charcoal grill, place asparagus on the rack of an uncovered grill directly over medium coals. Grill for 7 to 10 minutes or until asparagus is crisp-tender, rolling asparagus occasionally to ensure even cooking. (For a gas grill, preheat grill. Reduce heat to medium. Place asparagus on grill rack over heat. Cover and grill as directed.) 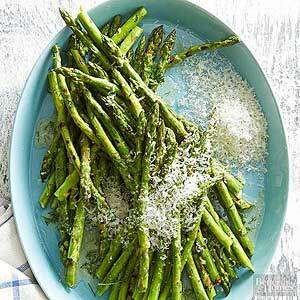 To serve, transfer asparagus to a serving dish. Sprinkle with Parmesan cheese.